by Worshipful Donald L. French. Seventy-six years ago, when what is now the City of Brockton was just a town, the Brethren of the South End had to travel "way up" to Paul Revere Lodge when they wished to participate in Masonic activities. This was really quite a trip in those days, especially on the cold winter nights. Without doubt, this was one of the reasons for a meeting on January 24, 1877, when twenty of these Brothers convened in Good Templars' Hall, diagonally across the street from our present apartments, to consider the possibility of forming a new Lodge. Several more meetings were held and then "after due deliberation it was voted that a petition be presented to the Most Worshipful Grand Lodge of Massachusetts for dispensation to work as a Lodge." The petition was granted by the Grand Master, Most Worshipful Charles A. Welch, on February 14, 1877; and on that same evening, the petitioners assembled, the dispensation was read, and thus Saint George Lodge, A. F. & A. M., came into being. The first officers of this new Lodge under dispensation were: W. M. Hervey N. P. Hubbard, S. W. William Richards, J. W. Hiram A. Monk, Treas. W. Snow Green, Sec. Flavel B. Keith, the first three being named by the Most Worshipful Grand Master at the granting of the dispensation. We lived in Good Templars' Hall for nearly seven years, then moved up the street to Goodall's Block, where we stayed about two years. About this time, Kingman Block was completed and we moved into these quarters, holding our first meeting here on January 20, 1886. Since our birth we have had forty-one Masters, but only four Treasurers: William S. Green, Rufus P. Keith, Irving L. Bumpus and Lawrence E. Allen. We have had seven Secretaries: Flavel Keith, George W. Cobb, George A. Clark, Alfred W. Lawson, George W. Harrub, Donald L. French and Wilfred Benson. Brother Alfred W. T. Lawson was an outstanding example of devotion to the Lodge and the Fraternity in serving for forty-four consecutive years as our Secretary. Wor. Bro. Melvin C. Derick was our only Master to be called home by the Grim Reaper during his term of office. At near the completion of his second year as Master, Wor. Bro. Derick died in the fall of 1907 and was buried from the parlor of these quarters. Saint George Lodge has always endeavored to work diligently, live creditably and act honorably by all men, and we are justifiably proud of the honors which have been bestowed upon us through some of our members. To date, five of our members have been appointed District Deputy Grand Master: R. W. Charles B. Lawrence, R. W. Myron L. Keith, R. W. David Perkins, M. W. Roger Keith and R. W. Ralph W. Copeland. R .W. Myron L. Keith and M. W. Roger Keith each received the further honor of being appointed Deputy Grand Master. Of course the acme of honors came to us when in December 1947 R. W. Roger Keith was elected Most Worshipful Grand Master of the Most Worshipful Grand Lodge of the Commonwealth of Massachusetts, a position which he so ably filled during 1948, 1949 and 1950. In 1946 another honor came to Saint George Lodge through the election of R.W. Ralph W. Copeland to be Most Excellent Grand High Priest of the Grand Royal Arch Chapter of Massachusetts. Thus, at one time, Past Masters of Saint George Lodge were the head of these two Grand bodies in Massachusetts, a truly unusual honor. Although these were the outstanding honors, many of our members have made their Masonic contributions and brought honor to their Lodge by serving as officers and being exalted to leadership of the various collateral bodies. We are also proud of the attainments of our members in civic affairs. Politics must not come into Masonry, but we have always believed that it was good for men of Masonic calibre to get into politics. Five of our Brothers have served as Mayor of the City of Brockton, beginning with one of our Charter Members, Bro. Ziba C. Keith, who was the first Mayor of the City, and followed through the years by Wor. Charles Williamson, Bro. John S. Burbank, M. W. Roger Keith and Bro. Fred D. Rowe. These and other members have taken their places in city, state, and national affairs, ranging from city council to U. S. Government diplomatic service. Many of our members are in the educational field, some serving as teachers, some as principals and some as superintendents of various public schools. Saint George members have taken their places and served with distinction with the armed services in every national emergency that has arisen during the lifetime of the Lodge. We feel that we have been most fortunate that out of this number only one made the supreme sacrifice and lost his life in action. This was Bro. George Herbert Kingman, in World War I. May he ever be happy in the Celestial Lodge above. We have a number of fifty-year Masons, but our outstanding youngster is Bro. Lyman Augustus Eldredge, who was made a Mason in this Lodge on the thirteenth of March, 1889. That was before many of us ever saw the light of day. Brother Lyman, we salute you! Saint George Lodge has always enjoyed the most cordial and happy relations with our Most Worshipful Grand Lodge and has been favored by many visits by the Most Worshipful Grand Master. As related earlier, Most Worshipful Charles A. Welch was with us at the time of our being constituted. Most Worshipful Rev. Dudley Hays Ferrell, a former Brocktonian, was with us on March 13, 1928, when we celebrated our fiftieth anniversary. Most Worshipful Samuel H. Wragg was very generous of his time and paid us several visits during his term of office. One of these visits in 1946 was for the purpose of presenting the Henry Price Medal to his Deputy Grand Master, R. W. Roger Keith. The next Grand Master to be installed was Most Worshipful Roger Keith, and under his direction, we were privileged to have the Most Worshipful Grand Lodge visit us for the purpose of raising to the sublime degree of Master Mason Most Worshipful Bro. Keith's son, Mark. This must have been an especially happy occasion for Most Worshipful Bro. Keith, because Mark was his fourth son to be raised in this lodge-room. I am sure that if he had more sons we would have more Brothers here. And tonight we are again honored by having with us another former Brocktonian, whom we all love and respect, the present Grand Master, the Most Worshipful Rev. Thomas Sherrard Roy, who is here to help us celebrate our seventy-fifth anniversary. We are proud of our record, but we are also humble. The achievements of the past will mean nothing if we do not in the future continue to practice even more and better Masonry. Be yours to hold it high." (For the history of Saint George Lodge for the period from 1878 to 1953 refer to 1953 Mass. 71-75). Our 75th anniversary was celebrated by a banquet held on March 13, 1953 at the Walk-Over Club. Church service was again conducted at the South Congregational Church on March 15 with Brother Malcolm Matherson, D. D. conducting the service. At that time we had the honor of having one of our members, Most Worshipful Roger Keith as Junior Past Grand Master. Most Worshipful Brother Keith greeted his successor Most Worshipful Thomas Sherrard Roy who visited our Lodge for the occasion. Worshipful Frank Sanborn was Master of the Lodge. The oldest member at that time was Brother Lyman Augustas Eldridge, who was a member of sixty-four years. Our first aprons were made by Thomas W. Child. The first collars were made by Miss Ella Stevens. The first bible was presented by Worshipful Brother Fred L. Trow of Paul Revere Lodge. The jewels were presented by Brother William S. Green, a charter member. Square and compasses were presented by Worshipful Brother Baalis Sanford. The first application ever received by Saint George Lodge was from Hubbard L. Hunt. P. Frank Green was the first brother raised under dispensation and Brother D. Cary Keith was the first to be raised under charter. During 100 years, Saint George Lodge has had six Treasurers and nine Secretaries. Brother Alfred W. Lawson has served the longest term as Secretary for forty-four consecutive years. Brother Abbot Godwin served as Marshal from 1951 to 1972. Our oldest living member in age is Brother Everett C. Clapp, born 1882. The oldest member as a Master Mason is Brother Raymond Jackson, a Master Mason since November 17, 1905. Second oldest is Brother Everett C. Clapp, a Master Mason since May 22, 1907. 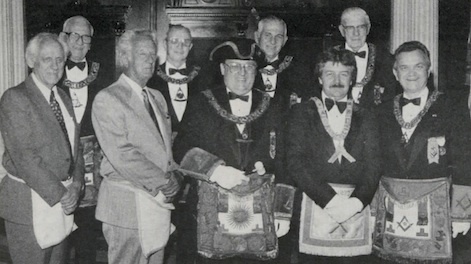 The third oldest is Brother Arthur C. Woodward, a Master Mason since February 28, 1912. Brother Charles Johnson is the fourth oldest member, being a Master Mason since March 20, 1919 and who attends meetings regularly. Our oldest living Past Master is Worshipful Donald L. French, who was Master in 1928 and 1929 and a Master Mason for fifty-six years. Saint George Lodge is a Lodge with a history of families. Beginning with Charter Member Thomas W. Child who became the fourth Master of our Lodge. His two sons who also became Masters, Worshipful Warren E. Child (1930-31) and Worshipful Wilbur C. Child (1946-47). His grandson Brother Walter T. Child is presently our Inside Sentinel. The Child family encompasses 100 years of Masonry, with Worshipful Wilbur and Brother Walter as active members today. Worshipful Charles Keith, Master 1904-05, his two sons, Brothers Clayton and Wayne Keith. Most Worshipful Roger Keith, his four sons, Worshipful Paul Keith, Master 1956-57, Brothers Roger Jr., Hastings and Wayne Keith. Brother Donald Winship, Sr., his son Worshipful Donald Jr., Master 1967. A brother, Roy Winship, and a grandson Brother Warren Winship. Three generations of the Holmes family; Brother Carlton Holmes, his sons, Brothers George and Kenneth Holmes, and a grandson, Brother James Holmes. Saint George Lodge is a Lodge of eminent Masons and public figures. A Grand Master of Masons, Most Worshipful Roger Keith. A Deputy Grand Master, Right Worshipful Myron L. Keith. Four District Deputy Grand Masters, Worshipful Brother Roger Keith, Myron L. Keith, Charles B. Lawrence and Ralph Copeland. A United States Congressman, Brother Hastings Keith. Five Mayors of the City of Brockton, including the first Mayor, Ziba Keith, followed by Charles Williamson, John S. Burbank, Roger Keith and Fred D. Rowe, all members of Saint George Lodge. The laying of the corner stone of City Hall, Brockton was attended by Saint George Lodge Brothers on May 30, 1892. The same enthusiasm, commitment, and principles that inspired the twenty Brothers in 1877, and laid the foundation on which this Lodge was built, still prevails today. In observance of our 100th anniversary with Worshipful Albert M. Grenier as Master, we pause to reflect upon the past and look forward to the future. On Wednesday, May 16, 1934, St. George Lodge, Brockton, Mass., held a special communication at which Warren R. Keith, Past Master (1890-91), raised his fourth son, Richard Harding Keith, to the Sublime Degree of Master Mason. He raised Warren S., his first son, March 28, 1917; his second son, Howard C., and third son, Robert D., on June 17, 1925. Another unusual experience in the annals of St. George Lodge was the final conferring of the Master Mason Degree on Gordon L. Caswell, an officer in the U. S. Navy, August 1, 1934. Mr. Caswell was elected to membership in the lodge in October, 1927. Unable to obtain shore leave, the first and second degrees were not conferred until June, 1932, and the third on the date above stated. The Grand Master's jewel once worn by late Brockton ex-Mayor Roger Keith was presented by his sons to the presiding Grand Master of Masons in Massachusetts in a ceremony Sat. evening, April 23, in the Brockton Masonic Temple by St. George Lodge. Retired U.S. Congressman Hastings Keith and his brother Mark Keith, presented their father's jewel to M. W. Albert Timothy Ames of Natick, who was accompanied by a large and distinguished suite. Congressman Keith, who resides in West Falmouth and Washington, D.C., was accompanied by his only living brother, Mark, who journeyed from his home in Redondo Beach, CA. Joining them were Bros. Bruce W. MacPherson of North Reading and Paul Silvia of Bridgewater, both members of the fraternity and married to granddaughters of Roger. A brother of Bros. Hastings and Mark, was the late Paul Keith who, like their father, was also a former Mayor of Brockton. Following the banquet, the Lodge reconvened where Wor. Peterson appointed a committee of Past and Presiding Masters to receive the Grand Master and his suite. Acting as Chairman was Wor. Frank Sanborn, Senior Past Master, assisted by: Wor. Burton L. Tibbetts, Jr., Wor. D. James Sarantopoulos, R. W. Robert D. Hermanson, Wor. Albert M. Greiner, Wor. Douglas A. Young, Wor. James C. Holmes, Wor. Robert C. Lawson, Wor. Eugene R. Devine, Wor. Bruce K. Pratt, Wor. William Crockett, Wor. Robert Farrell, and Wor. Kenneth Bowser. The Grand Master introduced his suite which included four Past Grand Masters: Stanley F. Maxwell, Arthur H. Melanson, J. Philip Berquist, and David B. Richardson. Also: R. W. Fred K. Bauer, Deputy Grand Master; R. W. Robert E. Godbout, Jr., Past S. G. W.; R. W. S. Forrest Kelliher, Past J. G. W.; R. W. John D. Dorr, Past J. G. W.; R. W. Harold T. Dodge, D. D. G. M. of the Brockton 29th District; R. W. Ara Manoogian, Grand Lecturer; and R. W. Lowell U. Hammett, Grand Marshal. The four Past Grand Masters spoke and recalled M. W. Keith's friendly and jolly manner. M.W. Berquist recalled Bro. Keith's ever-present cigar and the practical joke at Grand Lodge when someone put a rubber band inside the cigar that he was about to smoke. The highlight of the evening's festivities was the presenting of the ornate gold jewel by Hastings and Mark Keith. Grand Master Ames closed the event in ample form and the assemblage returned to the banquet hall for a collation and social period. 2nd Row: Past Grand Masters David B. Richardson, J. Philip Berquist, Arthur H. Melanson, and Stanley F. Maxwell. This page was last modified on 27 December 2018, at 11:22. This page has been accessed 17,635 times.